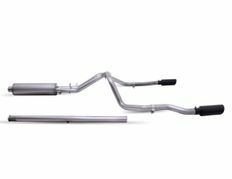 The part number for this item is Gibson 65689B and it fits 2019 Chevrolet Silverado GMC Sierra 1500 New Body 5.3 V8 w/ Factory Dual Rear Exhaust (5'8" Bed Crew Cab) models. This exhaust features a 3.5" Diameter that splits to dual 2.5" pipes and DUAL Black Ceramic Coated 4" Slash Cut Tips, exiting straight out the back. This is a Cat-Back exhaust, meaning all piping behind the cat is replaced.